D. L. Mayfield’s memoir in essays reads something like a Zen koan in which, time and again, the saying, “It is more blessed to give than to receive,” becomes its paradox, “It is more blessed to receive than to give.” Or the book could be read as a cautionary tale for would-be missionaries and do-gooders who are convinced they have everything to offer and nothing to gain in their endeavors. “Anticipation and Excitement” is marked by the writer’s belief that she has many gifts to offer destitute people, skills to help them assimilate but most markedly the opportunity to convert them to Christianity: “For, of course, in viewing our differences, I thought I was the sun and they were the darkness” (p. 6). In “Reality Sets In,” Mayfield realizes that the various gifts she tries to offer not only are difficult to pass on; neither are they wanted. Initially she is assigned to teach English to the matriarch of one family—a woman whose traumatic life to this point has left such overwhelming residue that she can neither want to learn new skills, nor has she the background for learning to read and write English, never having learned those basic skills in her own language. 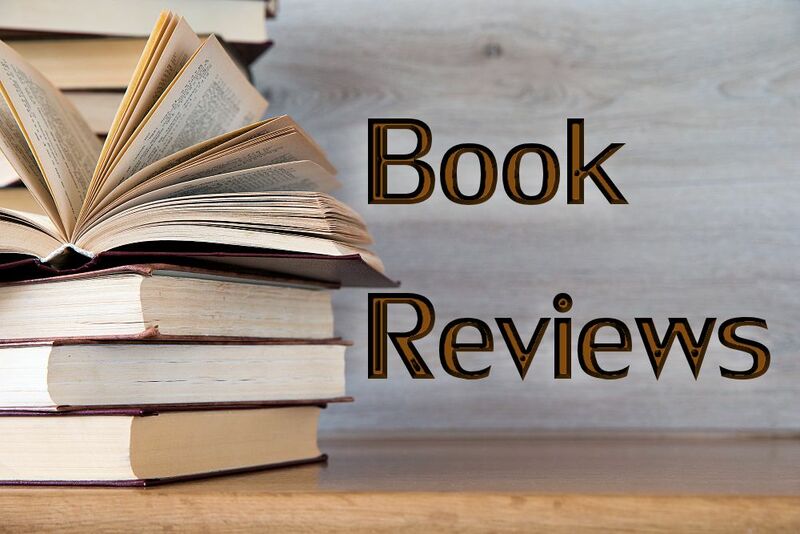 During this stage, the author begins to examine the question of conversion, wondering why, when she is so intent upon converting her Muslim friends, they have no similar agenda on her behalf. Depression comes with the shocking realization that the author’s highest gifts are of little value to her Muslim refugee friends; they politely listen to her Bible stories and go on in survival mode. She beings to understand how deeply her friends drink from the simple pleasures their lives offer. As she acknowledges both their poverty and their richness, she writes, “And only when I recognize how poor I really am do I start to understand that I am right where I need to be” (p. 116). It is in the poverty wrought by her life of privilege that she comprehends what she is being taught by the poorest of the poor. My favorite essay in the book is the culminating one, “The Ministry of Cake,” in which Mayfield sees herself as the older brother in the tale of the prodigal—the one whose Christian privilege meant she had never before left home, the one whose deep, daily encounter with refugee families meant finally embracing her own poverty of spirit. And then, in a lovely list, she acknowledges that her ministry is not the glorified, risk-taking one practiced by her missionary heroes; it is the ordinary ministry of “playing video games with awkward adolescent boys…of bringing takeout food to people whose baby is very sick in the hospital…of washing dishes without being asked…of drinking a terrible cup of coffee with a bright smile” (p. 199). And in embracing this ministry she knows she is following the example of Jesus, who “sought out the stateless wanderers [and] the exiles…” (p. 200). Assimilate or Go Home is filled with profound, paradoxical insights gained through years of living with the least of Jesus’s folk. These are most often presented at the end of a section or an essay. I never did quite get the hang of the title, though, and I couldn’t decide if that was because I lacked the tools I needed to unpack it or whether it was just too obscure. The phrase is mentioned only twice in the text, and I went back to those spots several times to try to grasp their significance. I imagined initially, in part because of the red, white, and blue theme of the cover, that the phrase reflected an American attitude toward refugees. I decided in the end that, perhaps, it had to do with the role of Christians in the Kingdom of God because, as Mayfield points out, we are the ones who are expected to bring the kingdom to Earth, and the kingdom is both “now-and-not-yet” (p. 26), thus neither something into which we can assimilate nor something to which we can go home. I found myself coming up with alternate titles as I read, while hoping for ultimate enlightenment that never fully came to me. My favorite alternative was The Radicalization of a Would-Be Missionary; the paradoxical treats Mayfield dishes out create a rich field for radical growth. My preferred title would reflect the author’s admission to her own hypocrisy and that of Christians in mission mode. But perhaps my title would not fit Mayfield’s target audience. 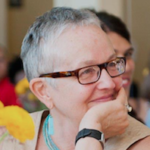 Certain assumptions of prior knowledge identified her readers as evangelical, since Mayfield offers, sans explanation, phrases such as “the four spiritual laws” (p. xii), “unreached people groups” (p. 21), and “the 10/40 window” (p. 174). The other hint as to her audience, and perhaps her own belief, is an absence of inclusive language to refer to God. 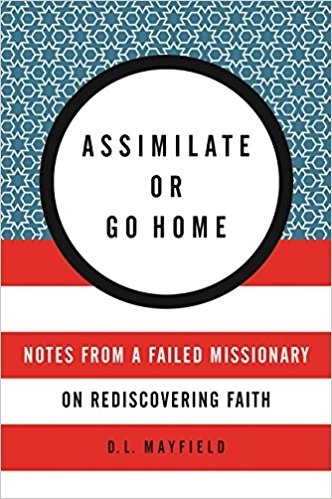 Regardless of my difficulties with its title, Assimilate or Go Home offered me a deeply sensitive, honest look at the morality of missions, how we do mission, and the gifts that ministry generously gives us when we minister—that perhaps we are greater beneficiaries than the recipients of our spiritual largesse. I loved the deceptively simple conclusion that true ministry may just be about showing up. And showing up again. As Mayfield writes, “It turns out that I am terrible at converting people the old-fashioned way…. Instead, I have the much less interesting spiritual gift of showing up and sitting on couches, of doggedly arriving, gamely prepared to help in whatever crisis of the day, and eventually fading into a background player in a story that was turning out to be much bigger than me” (p. 165). And of course, the story is so much bigger than any of us.